DD1 jsut started school this week. I’m about to embark on a close encounter with the Japanese school system. There was an entrance ceremony so now everyone around here is asking me about the “entrance ceremony” in Canada and how is it different. Well, it’s VERY different because there is no ceremony in Canada! I don’t know why but I remember my shoes on the first day of school. All that excitement and I was most excited about being able to tie my own shoes. They were red and white with candy cane striped laces. I can still remember the smell of my new crayons. Isn’t it funny what you remember. All I remember about a “ceremony is that we bring the kid in and let him/ her go in to the class on his/ her own. Some will scamper in all excited, some will hesitate and some will cling to Mommy’s leg crying? Anyway, in Japan it’s something like this. We get all dolled up and show up quite early for the big ceremony. We register and get sent to the class where kids are introduced to their cubby and desk and told where everything goes. This book on that book. Umbrella on the right, small spit collecting instrument (pianica) on the left on top of the math set… Kids find their seat and wait while the parents are shooed out. Parents are brought in and made to sit in the audience. Parents on one side of the room, all the school kids on the other (the whole school), teachers sat on the side at the special teachers’ chairs and “special guests” (mayor or a representative, board of ed rep, PTA head and so on) on the other side. There’s a mini speech something to the effect that “The 57th entrance ceremony of Yasuda school will now begin. All rise. Bow. Stand for the national anthem”. It’s a pretty fomal…. then some more stuff and then…. dadadada…. “The new first year students will now come in. Please applaud. as they come in”. (we have to clap for quite some time) but this was so cute. All these toothless kids came on the stage escorted by a grade 6 student who held their hands, lead them to the center of the stage, off the stage and to their seat at the front of the audience. Then there are more speeches and they call each kids name and the kid must stand up and answer. Kind of like a role call. Then more speeches. The principle did a simple science experiment to encourage curiosity. The made a few presentations and then the official word “Here ends the 57th Yasuda School entrance ceremony. All rise. Bow.” and the kids march down the isle so we can see them all and out the door to their classroom. Then we gather for the class photo. Parents get briefed again about stuff. I have no idea what. 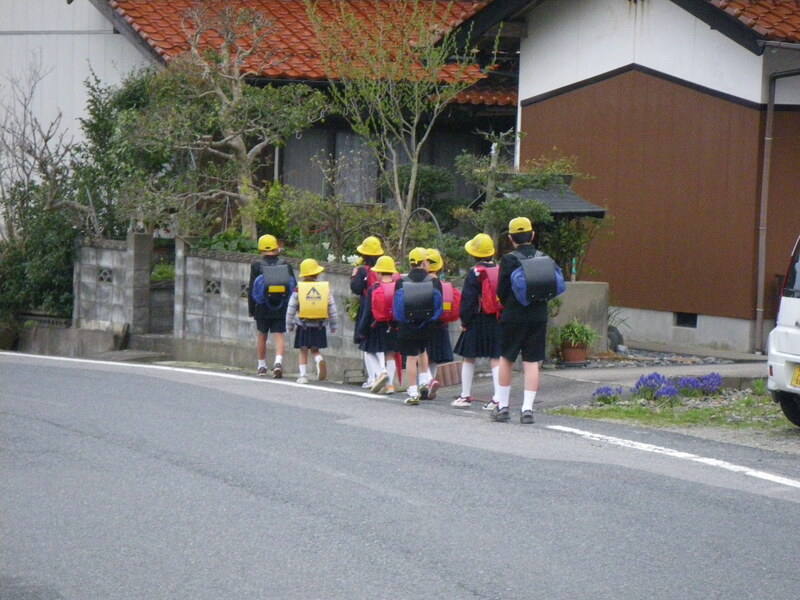 The grade sixes had signs to “call” the wee ones so they would know their walking routes. Our neighbour is in charge of Leona’s group. It’s SO Japanese. We know the boy but he introduced himself and handed over a paper with his name and where to meet and what time. there it was. “Hiroya Shimose, meet at the Skyfarm sign at 6:55”. Then he added, and this was so cute, “But you may not know where that is so I will pick you up at your place at 6:50 tomorrow”. All that done, and a few more bows and we are free to go. I took DD1 out to a fancy French restaurant for lunch to celebrate. Then the next day…. rrrrrrrrrrrrrrrrring………. eeeeerrrrrr it’s still dark! She had set the clock for 4:30! We were off to good start. I refused to get up that early but my body would not go back to sleep. In the end we got up 5:45 and managed to get all ready in time. It was blowing and raining a storm! Rats. 6:50 (Japanese precision). Ding dong. Not just the leader, but all 4 kids were there to lead my little treasure to the “meeting place”. Off they went. Sheesh…. About 5 minutes later they came back. Hiro explained that this was REALLY lousy weather for a little first grader to be out in and that she could go by car today. He bravely added “but we’re all used to it (grin)”. They ended up convincing their moms to drive them anyway. Quite honestly it was really crappy weather and I was worried about her. After all it’s almost an hour’s walk. The “squadron” head off to school. This morning was much more pleasant and there they were again at 6:50. Off they went leading my little girl down the road to school. She walked all the way there and claimed she wasn’t tired but when I got home at 9:15 tonight she was already asleep. 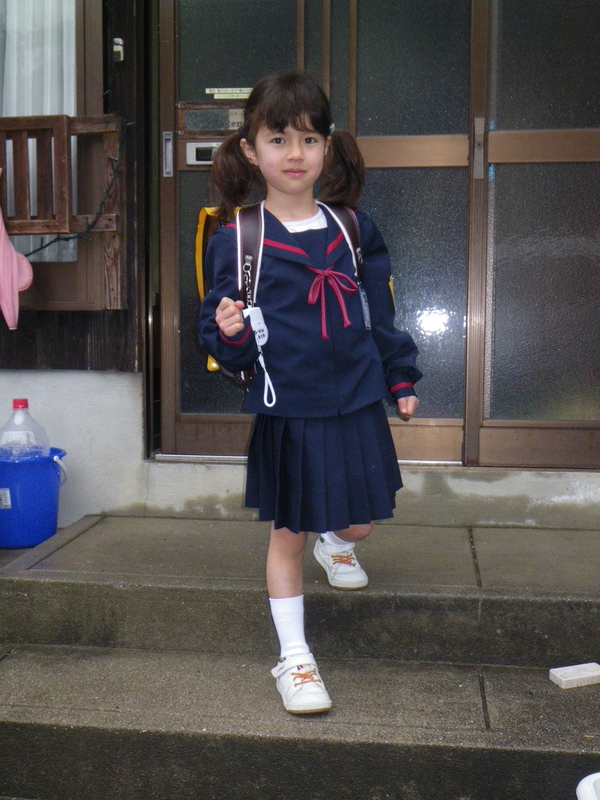 This entry was posted in Life in Japan, Musings on Japan and tagged first day of school, Japan, Japanese entrance ceremony. Bookmark the permalink.